You’ll need to make the bbq sauce the day before. See the recipe. Soak wood chips in water for at least 1 hour before use. Make a fire in your grill for indirect cooking and make sure it is ready to go soon after the ribs are done simmering. 1 tsp black pepper, roughly ground. 1. Place onion, garlic, cinnamon, cloves, nutmeg and pepper in bottom of large pan. 2. Place ribs on top of spices. 3. 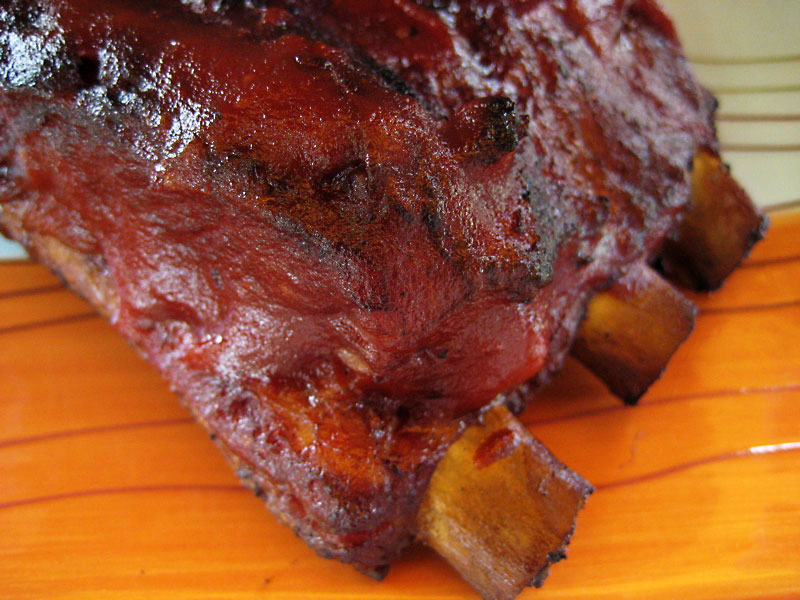 Cover ribs with water. 4. Simmer ribs in covered pan for 1-1/2 to two hours until tender. Meat should have pulled back from the bones about 1 inch. 5. Drain ribs and place directly over fire for a few minutes per side. 6. Move ribs to indirect heat in grill and coat with bbq sauce. 7. Drain wood chips and place on coals. 8. Allow to smoke for about 15 minutes. 9. Serve with bbq sauce for dippin’. Simmering can either be done on the stove top or in a 350 degree F. oven. Simmering adds complex flavor to the meat itself and makes it tender and moist. Direct cooking on the grill gives it a slight crust. For instructions on smoking with a gas grill, see this video. Nice recipe. I think I will need to check it out. I also just made some baby back ribs and put them on my blog. If you are interested come by can check them out. Would love to hear your opinion.